The sale of the Waldorf Stadium Apartment Hotel is the city’s largest hotel transaction in 12 years. Australia’s Mulpha Group has emerged as the successful buyer of the Waldorf Stadium Apartment Hotel in Auckland, following a highly competitive sales campaign that presented multiple investors and closed with a 12-year sales record smashed. Selling at a yield of 6.99%, the 4.5-star property sold for an undisclosed sum, the process managed by CBRE Hotels and Colliers Hotels. 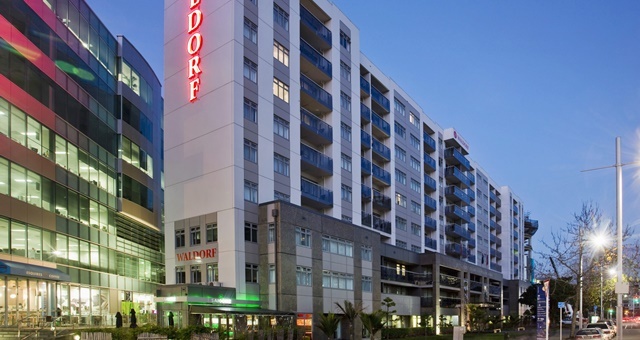 The transaction – the largest in Auckland for over a decade – was conditional to a new 11-year performance lease underpinned by Japan’s Daiwa House Group, which has a market capitalisation of US$19.15 billion and acquired the Waldorf serviced apartment business in Australia and New Zealand last year amid plans to grow the brand in this region. The 178-room Waldorf Stadium Apartment Hotel was built in 2008 and is located close to Queen Street, the Britomart precinct and the harbourfront. It offers a mix of studio, one, two and three-bedroom self-contained apartments. Mulpha Australia says it plans to capitalise on New Zealand’s current tourism boom and strong hotel market to boost occupancy and draw more visitors to the city. Mulpha CEO Greg Shaw said following the purchase that the strong fundamentals driving New Zealand’s tourism and hotel sector was a key reason for the transaction. “In terms of the Waldorf Stadium Hotel, we were attracted to its position in a key gateway city, strategic location in the heart of the Auckland CBD, together with several strategic opportunities to add additional value to this asset over the short to medium term working in conjunction with the hotel operator Daiwa House Group”. CBRE Hotels National Director, Wayne Bunz, said the Waldorf sale was the largest hotel transaction in New Zealand since it and Colliers Hotels worked to offload the Novotel Queenstown for NZ$91.3m in 2015. “This acquisition is a great addition for Mulpha to add to their significant hospitality asset portfolio in Australia, including InterContinental Hotels in Sydney, Sanctuary Cove and Hayman Island and Bimbadgen Estate”.